Over the past 5 years she has been performing a Tribute to Patsy Cline “Patsy Cline’s Greatest Hits Show”. 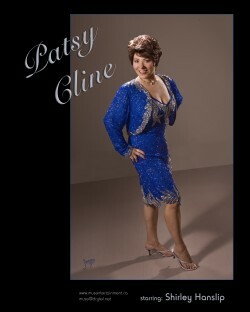 Shirley portrays Patsy Cline, by impersonating her and while in character she wears vintage clothing and accessories as Patsy would have worn herself. Shirley’s powerful voice has been compared to Patsy Cline. This Concert tells the story of Patsy Cline’s Musical journey starting with Patsy Cline’s early years with highlights of her greatest hits up until Patsy’s last performance. Shirley’s 5-piece band has been instrumental in duplicating the original sound set by the Jordanaires, which is rare to hear in this day and age. Shirley stated in an interview that she is honoured and sincerely blessed to perform this Tribute to Patsy. Shirley Hanslip’s performances as The Legendary Patsy Cline in her show Patsy Cline’s Greatest Hits has been getting fantastic revues. Her energy, style and interaction have been receiving great enthusiasm and praise from her audience members. Stealing the hearts of many, her rendition of Sweet Dreams leaves her audience in awe. With her audience always wanting more….